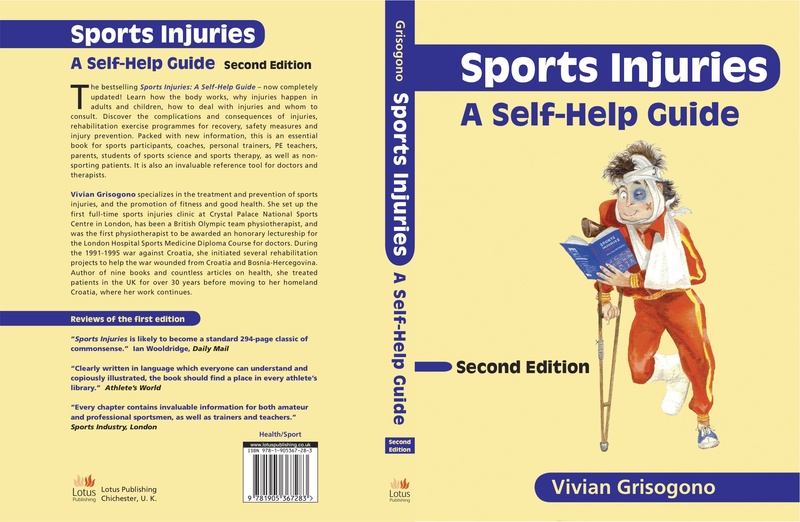 In this section, basic exercises are described in detail. They are listed according to the part of the body they relate to most directly, although many exercises are good for more than one joint or a single section of the body. The central part of your body is the key to how you move and hold yourself. Good balance between all the component parts - the pelvis, stomach area, low back, upper back, chest and shoulder girdle - is essential for all activities and for avoiding pain, especially in the back. Balanced trunk exercises are the key to avoiding back problems or recovering from back pain. Although you may need to focus on a particular part of your body because of injury or imbalance, it is always important to do exercises for the rest of the body as well, and especially for the central area, the trunk. You can learn how to do the exercises properly, and what each one is good for. Instructions on the pattern of movement, breathing pattern and appropriate speed are given with each exercise, as well as warnings on how to recognise when you should not do a particular movement. For maximum benefit, each exercise should be done very precisely, with attention to the details of the movement. Therefore, they should be done slowly at first, although some are also suitable for aerobic training, and can be done at speed once you have mastered the correct technique of the movement. For healthy joints, you need to maintain full mobility in each joint, combined with stability. Excessive loading or jarring should be avoided. Stability and good function in your joints depend on muscle efficiency and nerve-muscle co-ordination. Muscle conditioning exercises include strengthening and stretching techniques. Strengthening can be dynamic, involving a movement or movement pattern, or static, where a contraction is held for a few seconds and then relaxed completely. Dynamic exercises which aim to improve muscle condition and strength are usually done against a resistance, which can be bodyweight, a pulley or spring resistance, a weight, dumb-bell or weights bar, or a weight training resistance machine. Resistance exercise generally involves two types of muscle action, concentric and eccentric. In concentric action, a muscle group shortens to perform an action against gravity or a resistance, whereas in an eccentric contraction the muscle group lengthens out to control a movement which would otherwise happen under the influence of gravity or a load. These exercises are suitable for rehabilitation following injuries, and for general body conditioning. They are good for your muscles, joints, nerve-muscle co-ordination, circulation and balance. To create body balance, you need to select a variety of exercises covering the various parts of the body. In the normal way, the exercises you find most difficult are the ones you need most. The exercises are safe to do in most situations. Do pay attention to the safety instructions. They may not be suitable for people suffering from neurological problems, for instance after a stroke or head injury: rehabilitation for neurological impairment requires carefully directed patterns of movement, until recovery is well advanced. Patients suffering from neurological conditions of any kind should only do physical exercise under the guidance of a specialist neurological physiotherapist, or other appropriate practitioner. 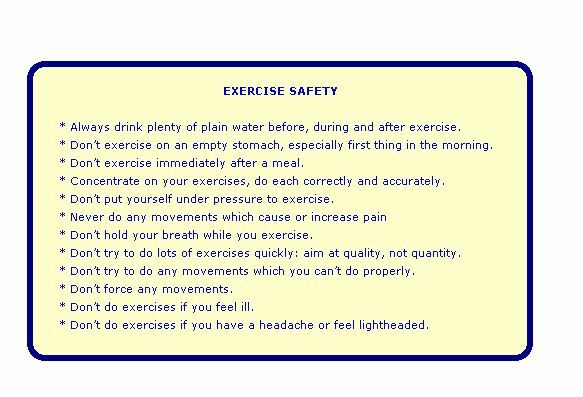 REMEMBER: never do any exercises which cause or aggravate pain. Do not start or continue exercising if you have a headache, dizziness or light-headedness. Never do strenuous physical exercise if you are unwell. If in doubt, always take advice from your doctor or a suitably qualified, experienced professional practitioner.